Home › Reception Get Baking and Squiggling! Reception Get Baking and Squiggling! Reception have been working on some interesting ways of developing their fine-motor skills and hand-eye co-ordination. The children have been ‘Squiggling!” Each child takes two ‘Squiggle Squares’ of fabric (one in each hand) and moves to music, creating the lines and shapes that are represented in our alphabet. These waving movements also support the development of fine-motor control. At the moment, co-ordinating their bodies in this way can be quite challenging for some children. The movements are then translated onto long strips of paper using crayons (again one in each hand) and are producing some lovely results. 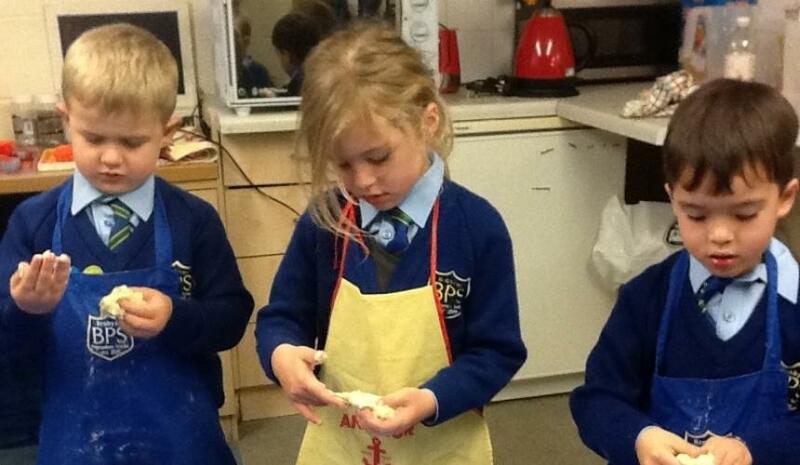 We have also been making bread. While this was a fun cookery lesson working with dough is a great way to strengthen muscles in the children’s hands which are the last to develop and therefore support the children on the road to writing. It is fantastic to see the children enjoying these great developmental techniques and having so much fun in activities that will help them achieve our goal of beautiful, cohesive, cursive handwriting.